Bernadette Bensaude Vincent is Emeritus Professor of Philosophy at University Paris 1 Panthéon-Sorbonne. Her research topics span from the history and philosophy of chemistry to materials science and nanotechnology with a continuous interest in science and the public issues. Among her recent publications: Chemistry. The Impure Science, (co-author J. Simon, 2008); Matière à penser. (2008). Bionanoéthique (2008), Les Vertiges de la technocience. (2009), Fabriquer la vie. Où va la biologie de synthèse (co-author D. Benoit-Browayes, 2011). Sacha Loeve is Associate Professor of Philosophy of Technology at University Lyon 3. Since his Ph.D. on molecular nanomachines (2009), he practices a ‘fieldwork philosophy’ centred on objects and primarily interested in rethinking technology as a narrative logos of technics. His publications include works on Gilbert Simondon, nano-objects, images and technology, pharmacotechnology, synthetic biology, Moore’s Law and electronic waste. Alfred Nordmann isProfessor of Philosophy at Darmstadt Technical University, after receiving his Ph.D. in Hamburg (1986) and several years on the faculty at the University of South Carolina (1988-2002). In the field of History and Philosophy of Science and of Technoscience he is interested primarily in the questions of knowledge and objectivity, explanation and understanding under representational and technological conditions of knowledge production, see Science Transformed (co-edited with Hans Radder and Gregor Schiemann, 2011) and Science in the Context Application (co-edited with Martin Carrier, 2011). Astrid Schwarz holds the chair of General Science of Technology at Brandenburg Technische Universität Cottbus-Senftenberg. In her resarch she asks questions about the status and power of concepts, models, and objects in the process of generating, stabilizing and demarcating scientific knowledge. Recently, she focuses on debates around green cultures and ecotechnology, as well as on gardens as models to act in the Anthropocene. Her last book was Experiments in Practice (2014). Even though technoscientific research is as old as alchemy and pharmacy, agricultural research and synthetic chemistry, philosophers of science had little to say about it until recently. This book series is the first to explicitly accept the challenge to study not just technical aspects of theory development and hypothesis testing but the specific ways in which knowledge is produced in a technological setting. 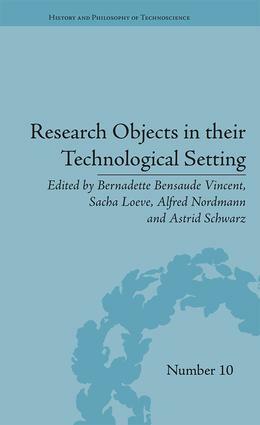 When one seeks to achieve basic capabilities of manipulation, visualization, or predictive control, how are problems defined and research fields established, what kinds of explanations are sought, how are findings validated, what are the contributions of different kinds of expertise, how do epistemic and social values enter into the research process? And most importantly for civic observers of contemporary research: how is robustness and reliability achieved even in the absence of complete scientific understanding? Editorial Board: Hanne Andersen (University of Copenhagen), Bernadette Bensaude-Vincent (University of Paris,　Sorbonne), Martin Carrier (University of Bielefeld), Graeme Gooday (University of Leeds), Don Howard (University of Notre Dame), Ann Johnson (Cornell University), Cyrus Mody (Maastricht University), Maureen O'Malley (University of Sydney), Roger Strand (University of Bergen), Nancy Tuana (Pennsylvania State University). Direct inquiries to Alfred Nordmann [e-mail link: nordmann@phil.tu-darmstadt.de] or Robert Langham [e-mail link: robert.langham@informa.com].